South African police have been accused of planting weapons near the bodies of workers killed during strikes at the Marikana platinum mine. Photographs taken by police suggested large knives had been placed near the bodies after they had been shot, a lawyer told an inquest into the deaths. 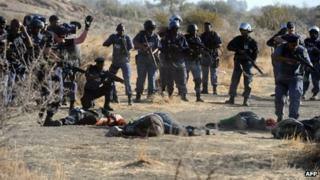 Thirty-four miners died when police opened fire at striking miners in August, leading to widespread shock. The police say they were acting in self-defence. The bloodshed occurred on 16 August, days after the deaths of 10 people, including two police officers who were hacked to death. Judges are holding an inquiry into all 44 of the deaths. The inquiry was presented with photographs showing the bodies of the miners after the shooting - the most deadly police action since the end of apartheid in 1994. In one photograph, a dead man is seen lying on rocky ground near the mine. A second picture, taken later the same day, is identical except a yellow-handled machete is now lying under the man's right hand. "The evidence clearly showed there is at least a strong prima facie case that there has been an attempt to defeat the ends of justice," lawyer George Bizos told the inquest, according to the Sapa news agency. Lawyer for the police Ismael Semenya told Sapa that the national police commissioner Riah Phiyega had begun an investigation into the allegations. He said police authorities had been aware of the photographs since they were handed to the inquiry two weeks ago. The BBC's Pumza Fihlani in Johannesburg says the court also saw video footage which showed the dead bodies of miners with their hands handcuffed behind their backs. The shootings caused huge shock in South Africa and led to comparisons with apartheid-era policing. In the immediate aftermath, authorities sought to portray the miners, who were striking illegally, as responsible for the violence and bloodshed. Some 270 of the striking miners were arrested and charged with murder, though the charges were later dropped. The strike ended in September after workers agreed a 22% pay rise with the mine's owners, platinum giant Lonmin.